These leggings are made in double waistbands so you can feel more comfort during workouts. Composed of three types of fabric. In its front the honeycomb effect is a must. In its back, it has a black fabric, and it also has a detail in mesh in the knee zone. 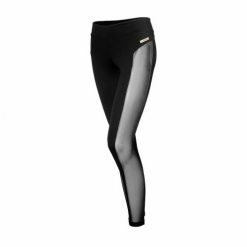 Ondina leggings are composed of three types of fabric. In its front the honeycomb effect is a must. In its back, it has a black fabric, and it also has a detail in mesh in the knee zone. 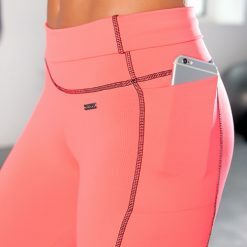 These leggings are made in double waistbands so you can feel more comfort during workouts. In its internal part, it has elastic so that the waistband is always in place. The elastic inside the waistband keeps it in place. The cut in beak on the back values the silhouette. 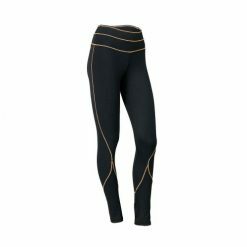 The compression of the fabric is ideal for any low, medium or high impact exercise. In addition it is beautiful and very discreet.